The local church is the basic unit of the United Church of Christ. That means that our congregation has a great deal of independence and autonomy in the conduct of our ministry: we own our own building, call our own ministers, and are responsible for the ways we worship and work. 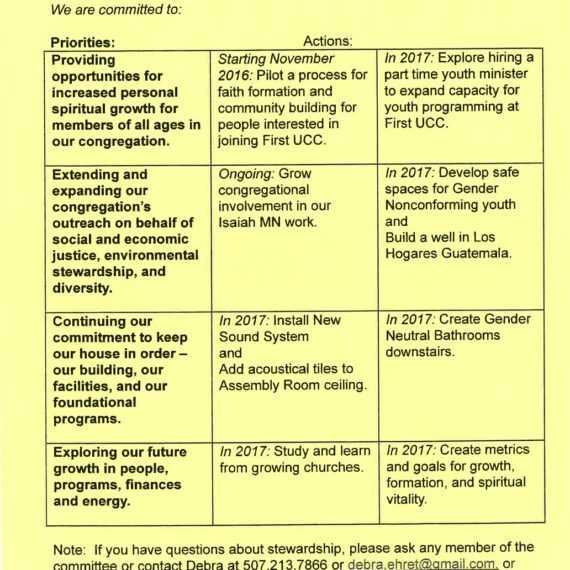 Unlike other denominations, the “wider church” (Minnesota Conference or national UCC) does not dictate policies or doctrines, nor does it have the power to “tax” the local churches (our donations to these ministries are entirely voluntary). Our UCC identity is central to the life of our congregation, not because “they” tell us what to do, but because “we” work together with other like-minded Christians to accomplish what we could not do on our own. 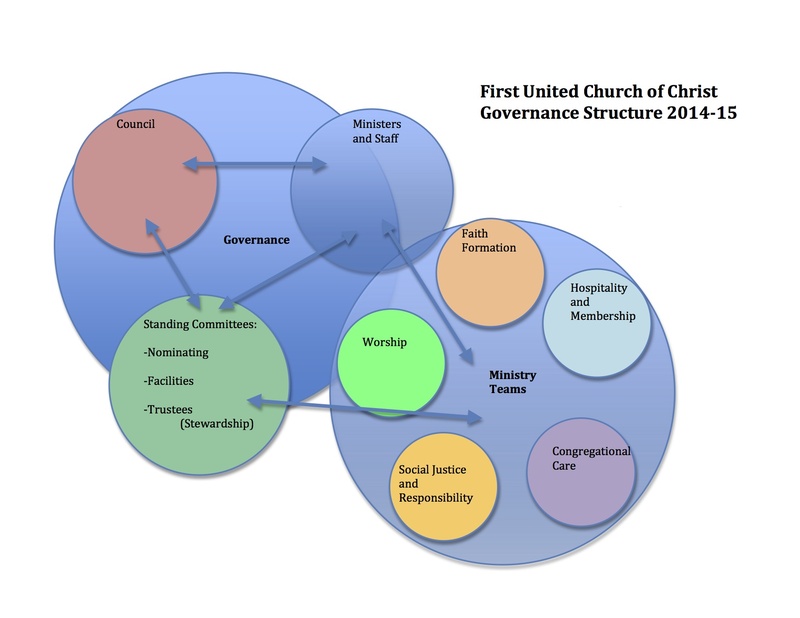 2014-15 was a trial year for a new governance structure at First UCC based on Governance and Ministry: Rethinking Board Leadership by Dan Hotchkiss. At our 2015 annual meeting, we voted to assume this governance structure permanently. Part of the role of the Council in the new governance structure is to discern our direction and ministry priorities as a church. The council has developed a draft of ministry priorities for 2016 and seeks feedback from the congregation. Read our council minutes here. Each January, the whole congregation gathers to review and oversee the life of the church. We elect officers, pass a budget for our local expenses, and conduct such other business as may come before the meeting. Special congregational meetings are called from time to time, usually by request of the church council, to vote on particular matters.